We thought we’d republish our post about lowering your AT&T bill as there are more cell phone providers in the market – but AT&T still remains one of the premiere players out there. While you may be able to save more with an MVNO provider, AT&T still offers some of the best service. My wife is still on their plan, even after trying to convince her to jump providers. After we started racking up some overage fees associated with one of our family member’s phone – I decided to do some digging on how we could get our AT&T phone bill lowered. Much like you, I hate paying more than I have to on bills that we don’t really need – like cable and cell phones. Many folks are getting along just fine without cable these days (one report cited that 1.8 million people dropped cable during the 2nd quarter of this year). I could see a day where we might drop cable and extensive cell phone plans. But since I can easily get out-voted in our household (I think a wife’s vote counts as 1.5 – 2 votes) I needed to find a way to lower some of our cell phone bills. Both my wife and I got our plans together in 2009. Shortly after, AT&T decided to do away with their “unlimited” plans – but they grandfathered those who were already on that plan – and let ’em stick with it. I kinda think this was a genius marketing ploy – cuz it causes you to feel like you are “stuck” in a plan AND that you are getting the best deal around. Trust me – there are better deals: a prepaid phone OR no phone at all. My step-son does not have unlimited everything (save for texts – he once set a an unofficial AT&T store record for the most at that branch in a month.. ). And, he uses the web – a lot. The AT&T Mobile Share plans are an alternative for us – but would require my wife and I to leave our grandfathered plans. This could save us about $10 a month – but then you don’t have that assurance of not incurring further overage fees. Due to the unique nature of our plan and usage, I decided to do more research to see how we could lower our bill. I also called AT&T to see what they could do to get us lower rates. The following are ways that have worked for us – and I hope they help you too if you use AT&T and wish to get better rates. One thing that is working for us is that my wife is able to take advantage of a discount offered through her employer for 25% off our AT&T bill. I would recommend checking with your workplace too as they may have a similar offer in place for their employees. That savings can go a long ways over a years time. If you have several members in your family, it may benefit you all to join their Family Plan where you can get free mobile-to-mobile calls. You also get a bucket of minutes you can use for the whole plan. In our case – where we have one really high “utilizer”, there is the option to switch phones. This was suggested by an AT&T rep and it was something I never even considered. So, we are thinking about switching my phone out with my step-sons so that we can avoid the overage fees since I don’t use nearly as much web data. Of course this works for us because at least one of us has an unlimited plan. Best bet is to call up the AT&T rep (or go to a store) and walk through all your options with them. You’re likely to get somewhere faster with a representative if you get in touch with their loyalty department. Lay out your case – how you use the phones and see if there are any alternative plans/pricing that you might qualify for. Here’s a little-known tip that has worked for me several times. 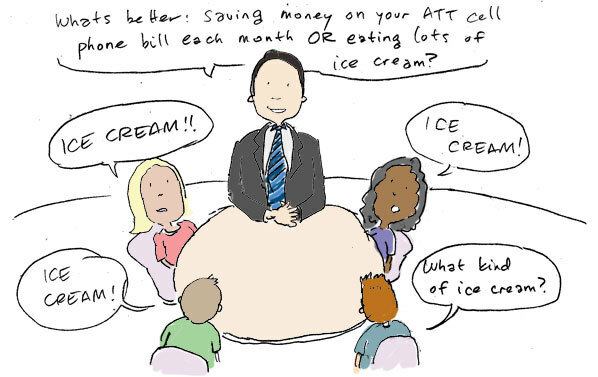 At the end of your conversation with a representative (either on the phone or at the store) ask the associate, “Are there any discounts I might qualify for today?” If you’ve been with AT&T for awhile, you’re more than likely to get a loyalty discount off your next months bill. I’ve had anywhere from $40-60 taken off the bill because of this. I wouldn’t recommend calling every month – but you probably could try it 2-3 times a year. I’m not a big fan of calling up a company and berating the representative on the other end. I think you can actually accomplish a lot more if you are polite and respectful. This person on the other end is a human too. They probably get tons of nasty, inconsiderate people on the line during their day. Be the bright spot in their day. They’ll likely be more responsive to you and look for alternative ways to help you out. I’d love to hear about any ways you’ve been able to lower your AT&T bill. Update 11/1/14: I have since switched my cell phone provider to Republic Wireless and would recommend them to almost anyone. I’ve been with them for two months now and pay (with taxes) $15/month for unlimited talk, text and data. It’s great and they are saving us $$ every month. Update 12/13/16: AT&T will be providing a refund to customers for bogus charges over the past years by order of the FTC. Average refunds will be about $31 and happen over the next 75 days. Update 1/25/17: While my wife remains on the AT&T plan, I have since moved (again) to Tello from Republic Wireless. While a new player in the MVNO space, I’ve been happy with their build-your-own-plan and cost is cheaper. Our office uses a bundle package and it seems like whenever we save on one item we lose a discount on another. In our area their are very few choices so we are pretty much stuck. I got a quote from http://voipsystemusa.com/ which claims they can lower long distance phone costs. Although I have to say our phone bill is FAR less than what we used to pay even 10 years ago, it’s still a big expense for us. Everyone seems to be converting to VoIP but I still don’t fully understand what it is and if it so great why would any one still be using their phone companies for service? Good list. Back when we were with AT&T, we’d call throughout the year and get discounts — it never failed. Still, we ended up going to PTel and now we end up paying no more than $10 a month…often less. Yeah – they are pretty good about giving ’em out when asked. You could always switch to Sprint, too. I’ve been with Sprint for 10+ years and while I’m not SUPER-happy with them, I pay $100/month for two phones. One with unlimited everything and one with a basic minutes plan that my wife (who barely uses a cell phone and doesn’t text or use the internet on a phone) uses. And another way to potentially save money is threaten to quit and leave for another service provider. And FINALLY, the best way to get good deals with Cell phones is to NEVER call Customer Service. Call INVESTOR RELATIONS and ask them to switch you to the Office of the President. The Executive Office of any Cell Phone provider has another layer of Customer Service that works at the Corporate HQ to deal with real issues. Works all the time for me with Sprint. Thanks for the suggestions Andy! Haven’t used the Investor Relations one – but I’ll bet that would really get you to the “Higher Ups”! Way to use the Family Plan Travis!